One of the Village's attractions which draws a steady flow of visitors, not only from the U.K. but from around the world, is the Church of St Thomas of Canterbury. It is a focal point of the Village, not only geographically, but also spiritually and socially. The Church's recorded history dates from 1110 and in the intervening centuries it has seen many changes resulting, towards the end of the 19th Century, in parts of the fabric falling into a sad state of repair. However, thanks to local support considerable but sympathetic restoration was put in hand following which the church re-opened on 17th December 1900 with a service conducted by the Bishop of Winchester. To commemorate this there was a special service on 17th December 2000 conducted by the Bishop of Guildford (under whose diocese the Church now comes) and attended by the Mayor of Guildford, who planted a Millennium Yew tree in the churchyard. In 2009 F.R.O.S.T. (Friends of St Thomas of Canterbury) commissioned and funded, with the generous support of East Clandon Parochial Church Council and others, a new stained glass window by Helen Whittaker, one of the UK's most prestigious stained glass artists. The window depicts Thomas a Becket, Archbishop of Canterbury, in the moment before his assassination and subsequent martyrdom in 1170. Read more in the F.R.O.S.T. newsletter. 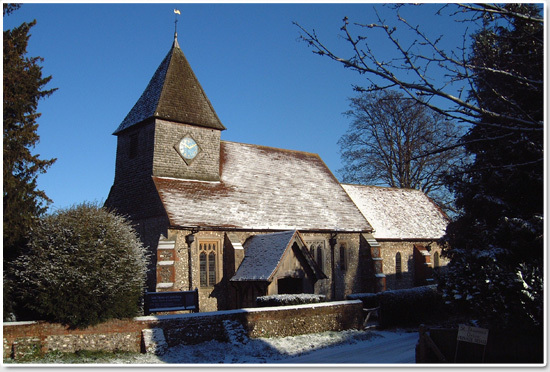 The Rev Barnaby Perkins was installed as the Rector of East and West Clandon on December 3rd 2013 . We do hope you will come and visit our attractive village and allow some time to explore our historic Church. A full history and guide, both to the Church and Village is available, also various postcards. 1st ,3rd,5th Sundays 9.15 Parish Communion (1st Sunday BCP ). 2nd Sunday 10 .30 Morning Worship (Combined Service with West Clandon ). Sunday Club for children in the Village Hall during the service. Followed by coffee in the Village Hall. 4th Sunday 10 .30 Morning Worship at West Clandon. (No service at East Clandon). Service of Reflection and Communion at 10.30 on the 2nd Sunday of each month. Everyone is most welcome at these services. Click here to view their names and regiments. During 2011 a major project to re-tile part of the church roof (the Nave and North Aisle) was undertaken with the kind and generous support of a £20,000 grant from SITA Trust through its Enhancing Communities Programme. SITA Trust provides funding to community improvement projects through the Landfill Communities Fund. This fund was set up by the government in the late 1990’s allowing landfill operators to divert some (6.2% in tax year 2011/12) of the landfill tax they collect for the treasury to organisations like SITA Trust. (More information on the work of the trust can be found at www.sitatrust.org.uk). Local villagers also supported the project via local charity, FROST, through ‘sponsorship’ of individual tiles. Together FROST and SITA Trust have enabled the fabric of the building, and in particular the North Aisle’s ornate plaster ceiling, to be safeguarded for the benefit and enjoyment of future generations. Further support for the project came from the National Churches Preservation Trust, who agreed to support the cost of the architects’ and CDM co-ordinators’ fees. Additionally, over 70% of the VAT (£2,300) was funded by the Listed Places of Worship Grant Scheme.